Small acreage with a fantastic view can be very difficult to find, particularly at a reasonable price. Well, just read this! Here is some gorgeous land to build your new home on in a country setting. 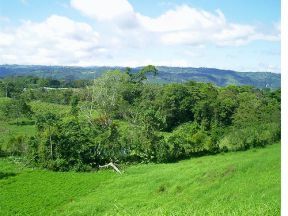 From the new home you will build on this beautiful land, you will have spacious, long range sweeping 360 degree views of the mountains including Volcan Baru, and views clear into Costa Rica. Elevation 870 meters ASL (above sea level) or 2,850 feet ASL means no heating or A/C needed but also not as cool and rainy or foggy as higher on Baru. Mild climate, with mild breezes. Not the strong winds experienced higher on Baru. Paved road at front of property provides a smooth ride all the way into town. 15 minutes drive to Volcan with stunning views the whole way, another 30 minutes to Concepcion. Water and electricity close (at road in front of property). High speed wireless internet available allows movie downloads and internet telephony. Strong GSM signal in the area assures mobile cellular service. Great soil for gardening. Land has been farmed, not rocky at all. 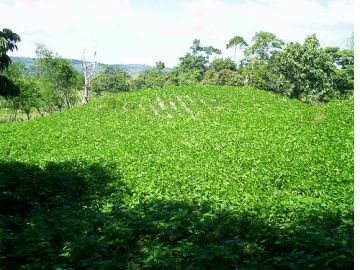 Should be able to grow many lowland as well as highland crops. Wild parrots and monkeys are among the wildlife. Tranquil, serene, quiet and incredibly peaceful. No noisy parties or loud music. North American pensionado couple are planning on building their own year-round residence at the rear of this four hectare property and are flexible as to amount of land to be sold ranging from several 5000 square meter lots (1.235 acres) or a couple of 10,000 to 12,500 square meter lots (2.471 to 3.089 acre lots) up to a full 2.5 hectares or 25,000 square meters (6.178 acres). (this is a major point for you to consider when buying land here). 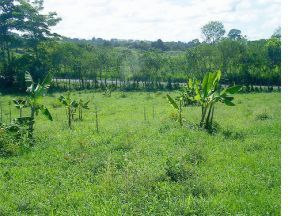 North American pensionado owner will sell this fully titled land near Caizan, Chiriqui Province for $10 a square meter for the smaller lot down to $8 a square meter for the larger pieces. This is a great opportunity to own more land for less money and to put more of your dollars into the construction of your new home. See the land right now by visiting the following website. No website registration necessary. Each picture can be enlarged to see a lot of detail including the incredible views. Owner/Seller: Rich Young, Volcan (English spoken), Chiriqui Province. Panama Cell (507) 6571-8495 USA 1-801-783-5867.